What is MPD? Many people misunderstand what MPD is. To be able to use it, first you need to know what MPD is and how it works. MPD is a service running in the background of your computer. His primary role is to search your folders for music files, put it in some kind of database, and when somebody wants to play some music, he will play it for you. How that works? You access this database and play music with your client. Client can be your iPhone, Android, Mac or some Windows machine. The thing is, no matter what client you use, MPD is the one who plays the music, and it plays it well. In the previous versions of AP-Linux you could install MPD from officially Linux Mint repository, but that packages were buggy and unstable. This time, we have build our version of MPD that plays perfect and have support for DSD. AP-Linux comes with three clients pre-installed. Cantata, GMPC and Ario. So lets go to configuration. 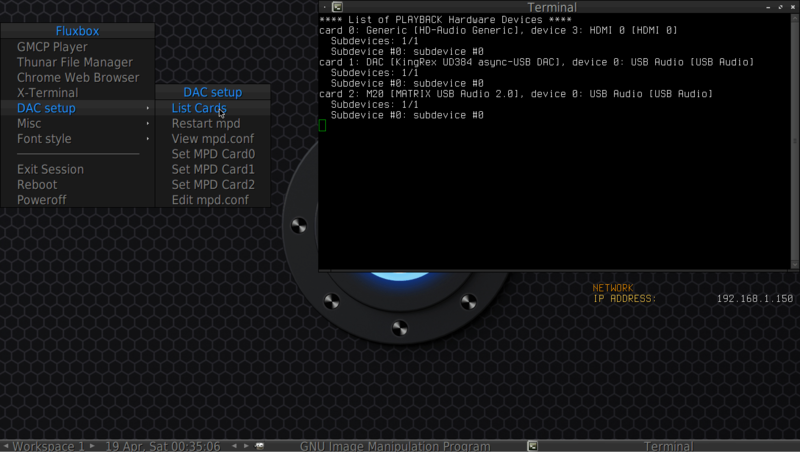 In AP-Linux V3 final, mpd.conf is already configured to output sound on first four sound cards attached to your PC. So actually you only need to configure path to your music. If you have DSD capable player, you should change configuration with Menu -> DAC Setup -> Set DSD-PCM playback and restart mpd service. To find out what sound cards are in your system, right click on empty desktop space to open a menu, and select DAC setup -> List Cards. As you can see, we have replaced “hw:0,0” with “hw:M20”. This is sound card that we want to use. We also added “Music” to the “music_directory” part. So MPD will look for music in /storage/Music directory. Save the configuration and exit editor. If for some reason you also have music in for example /media/some/other/dir, you can create link (shortcut in MS windows world) in /storage/Music directory and MPD will find that files also. You can create link like this: Of course, you need to open that black terminal and type this. This will create link in /storage/Music directory called other-dir that points to /media/some/other/dir and the MPD will find it. The principle is this: path to the original place – path where you want your link (shortcut) to be. Now that we have changed default configuration and saved it, we must restart MPD server. We do that with: Menu -> DAC Setup -> Restart MPD. The terminal will pop-up and you need to enter administrator password which is “muser”. If you have large database of music, it will take some time for MPD to populate the database. Now we can use our client to play music. Open GMPC (v3 beta1) or Cantata v3 final. Click on “Use Authentication” and enter password you set in mpd.conf. The default is 1234. Click “Connect” and then “Forward”. Now you are ready to play music. Add music navigating in “Database” and “right clicking” on the Folder or File. All you need to know is the IP address of AP-Linux and password that you entered in mpd.conf file. You can find what’s your IP on the right of your desktop. For Android, we like to use MPDroid app. It’s very nice and user friendly. I’ll use some of these infos to install MPD on my HTPC. Just a few words to comment how MPD change my ( audiophile and radiophile ) life. 1) whit a good asynchronous DAC the question if a pc based system can beat the most expensive dedicated players (cd, sacd etc) found the final answer. YES!!! if you are not too addicted to the static, solid and massive old digital sources and mechanichs, spend your money on the right d-d converter and dac. 2) the mpd clients can do incredible things, also outside the specific audiophile area: with a good client, for example “cantata” for windows systems, you can menage not just your files or supports, but also all the online resources. The right MPD client can ask mpd for playing online radio stations, cloud files and all the liquid music you can imagine, and is AP linux downloading the stream or files, not the machine where the client is running! I now online resources are not so relevant on audiophile specific area, but if you will tray it, it will be difficult to be whitout! How do you imported the music in cantata player? Since with audaciois and ddbeef i have no problem, i can’t figure out how to create a working play list in cantata. Thank you. 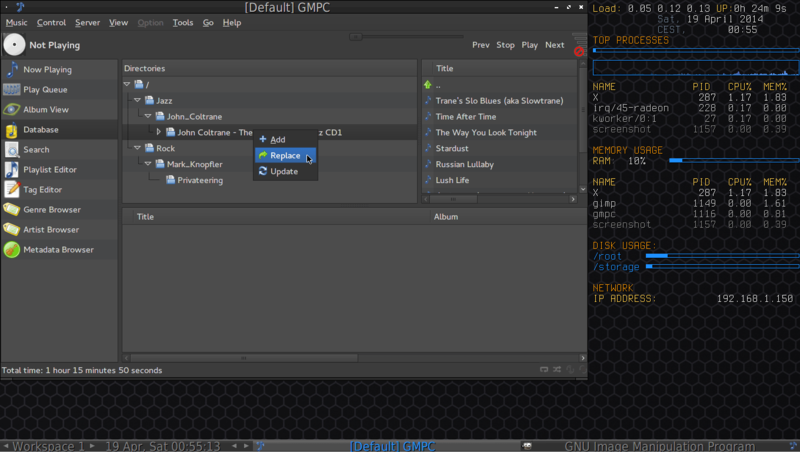 I cant find GMPC in the new version, only Cantata. Is it hiding in there somewhere? You can launch it from terminal. Just type gmpc. GMPC is abandoned project so we didn’t include it in the menu. I’ve tried MPD with gmpc and cantata. MPdroid is also working with my smartphone. But I’ve no sound. When playing 32bit/44.1 khz is shown. Files are wav 16bit/44.1 khz. I use the ESI Juli@ soundcard and have toslink connected to my DAC. Tracks are playing- but no sound. I have 4 Outputs activated as I could see. What is wrong in this case? But with Dead Beef player Juli@ card works without problems. Man, you’re perfect! It works! Yeah! BTW: Although coax and esp. USB are the better way to go for digital output, I can recommend LIFATEC’s Siltech glass fiber cable. Probably one of the best cables if someone want to go with toslink. but I just got a broken link. Could you help me to config this? I tried $ ln -s /IP Address but I cannot access my music library on my NAS device. I can access my NAS through KODI, but it is crashing very often… AP-Linux is not usable for me at this point. I accessed my NAS directly from a web browser. However, no sound is coming from browsers. PLEASE HELP!!! This is the message from Cantata, what should I do to fix it? Cantata should work out of the box. If you have problems reset config of with: Menu-Misc-Reset Config-Reset Cantata. I have another issue with audiophile, when I started use it today, there is no sound from my Yulong D200 DAC, which works yesterday. I already fix the Cantata issue. Type alsamixer in terminal, select your DAC and check that there’s no muted channels. Who knows what you did. Install it again and then try. How do you adjust the volume when using Cantata and MPD? The only thing I could figure out was opening up a terminal, running alsamixer, and reducing the volume there. But my understanding is adjusting the volume using alsamixer is doing it in the digital domain, resulting in a reduction in bit resolution? Devices like the Dragonfly or Geek Out say that the music player software should be able to adjust their internal volume control, and they instruct you to set the computer volume to max and use the player’s control (Deadbeef, etc.) to set the volume. How do you do that with MPD and it’s client? This Package of MPD support playing DTS WAVE, How can I install it to the ap-linux mpd? 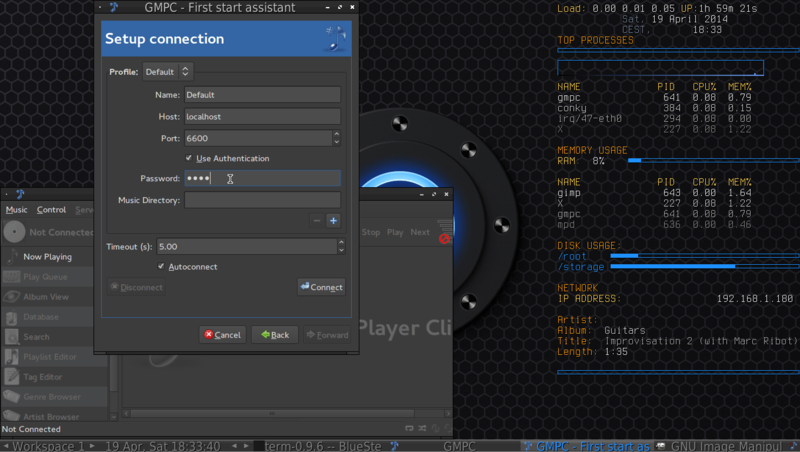 I’m using aplinux for 2 or 3 months and I really enjoy it.Thanks a lot for this application, It’s a very good work !!! I’ve got a little problem. When playing music with cantata / mpd and switching from a type of file to another (from wav to flac or wav to dsd for example) cantata displays an output error : “MPD reported the following error : Failed to open audio output”. The log file gives more details : “alsa_output : Failed to open “card1” [alsa]: error opening ALSA device “hw:1,0″ (snd_pcm_hw_params) : no such device or address”. Do you have any idea about how to avoid this error ? Delete all cards in mpd.conf except one that you are using. Replace “hw:1,0” with “hw:DAC-NAME”. issue of your DAC and you need to contact the manufacturer. I’ve got no news about Denon, but I tried new tests. I took my hard disk in witch aplinux is installed from my lenovo G50-30 labtop and put it in a Dell L412. All works fine : no more error message when playing a flac file and switching to a wav or mp3 file !!!! Do you have ideas about what’s wrong with my lenovo G50 ?!!! I am using Ap-Linux V3 since a few days. Fisrt thanks for this nice out of the box distro . This Dac have an USB 32/384 DSD . I can play .dff file with JRiver on Ubuntu 14.04 or Mac OSX on usb so the dac is OK.
but if they are not i can t play dsd anyway. JRiver on Ubuntu 14.04 or Mac OSX so the dac is OK.
Secondly how can i choice french azerty keyboard and french langage too ? Remove buffer_time “” and period_time “” and restart MPD. For French keyboard put “setxkbmap fr” line in /home/muser/.fluxbox/startup file. and i see the indicator reader moving from left to right. As i can play .dff file with JRiver/foobar 2000 ( with wine using winealsa.drv ) on Ubuntu 14.04 , what can be the problem ? Hi, I have a problem with cantata the data base will not populate, I have checked path /storage/Music and mpd config. is there any solution. above preferences can affact smoothing of sound? Yes they can. Loose the buffer and period time. Thanks your answer, I commented buffer time and peroid time lines and now seems ok.
Another issue occured, mpd can’t recognize cue file. but deadbeaf can. My cue files is UTF-8 format. I use client : MPDroid to control mpd on android phone via wireless network . Just installed AP3.0 and love the sound. I do get crackels because the output level was too high, but after setting Cantata to use replaygain it is fine. Now i have rebooted and the setting for replaygain is gone. How can i make the replaygain setting to stay? V3 final sound great, I am very satisfied, it just a little inconvenience that the Cantata player does not support traditional Chinese, cause metadata and album unreadable, can it be improved ? I re-installed mpd. After a boot I have to start mpd manually. Nothings works. What is the solution for this? 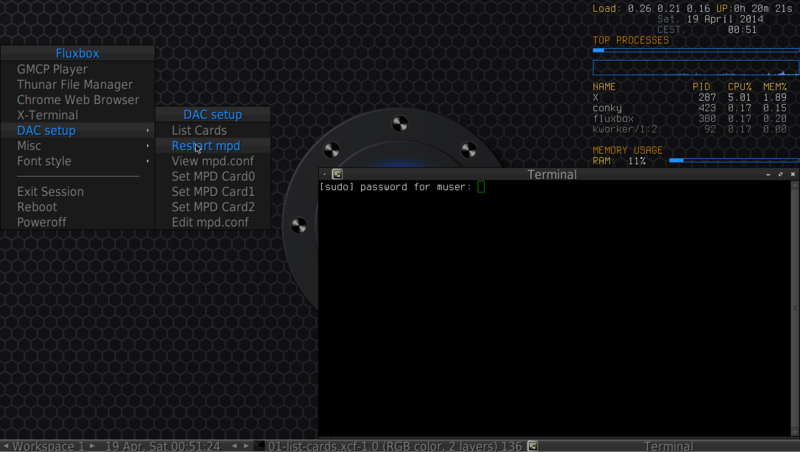 You have installed official MPD over Audiophile Linux MPD. This will brake things. The easiest way is to reinstall Ap-linux. What are the differences among “official” and “Ap-L MPD”? After installing AP Linux 3.1 I shold not reinstall MPD, other linux components only? I’ve got my USB Dac running with Windows and think its great. So I’m taking the plunge and moving to Linux for even better sound. I installed AP Linux tonight and now have a million questions but will start with just 2. 1. Why doesn’t Linux recognise my on-board PCI sound card? I have an EMU1212M and it works perfectly with windows 7/8 (after installing the drivers). I thought Linux was supposed to recognise sound cards automatically? Do I need to install some drivers? 2. Is Cantana the most incredibly non-user friendly software ever invented? I am a Linux noob, sure, but I am not an idiot (well my wife often tells me I’m an idiot but mainly when she’s mad at me). But I can’t get a peep out of Cantana. I have lots of DSD files that I want to play but I just look blankly at the screen when Cantana opens. There doesn’t appear to be any way to open music files. By contracts DeadBeef seems simple and easy to use (its easy to play files, but it doesn’t make any noise because of Problem #1). Looks like I’m on a steep learning curve after using Windows for 20 years. 1. You should ask your manufacturer. 2. No, there are more worse :-). Cantana (Cantata) is just interface to MPD server which is actually playing music. (I know it’s confusing). You can’t select song like in Deadbeef before you configure MPD. So learn what MPD is, configure it and then you can use Cantata, Mobile phone, Tablet, even your Windows and the sound will be great :-). OK thanks for the reply. I will continue to explore AP Linux. [sudo] password for muser: (solid green box). Then when I type nothing happens. I can hit enter, and then if try to type I get message “Sorry try again”. So, when I reboot APLinux, MPD has gone back to original config. But as described above, I can’t restart MPD. All very confusing. But it is working and sounds great, I just need to iron out the bugs. That you do not see anything happening when you type the password is normal for Linux. So just type the correct password and hit enter. Thanks Remco. The password is “muser”. Yes Linux is little confusing when coming from Win world. But that’s Windows problem ;-). The point is to configure MPD once to suit your needs (I suggest removing buffer_time and period_time) and enjoy the music. And don’t touch “Set DSD-PCM playback” ever again. OK got that. MPD is configured, and as suggested buffer and period are set to zero. I am really enjoying the music. One further question. My DIY DAC will only play back DSD at the present time. Can MPD or Cantata convert PCM to DSD on the fly? Foobar does this in Windows, and HQ Player will do this in Linux, but HQ Player costs $$. I have ripped all my CDs to my hard drive and want to play them through USB DAC. Thanks for your help, much appreciated. No, Cantata can’t do that. My opinion is, there’s no point of converting PCM to DSD. If it’s recorded in PCM, it’s done. Garbage in, garbage out. You can’t undone what that filters have done. After listening many DSDs, I can’t listen to PCM any more. No matter how good recording is, it sounds plastic to me, artificial. Does not have this more real, analog sound that you say. Yes I agree that DSD sounds much better than PCM. But … I have a lot of PCM files – i’ve ripped all my CDs and have bought many hi res down loads from HDTracks and ProStudioMasters. I still want to play these. My DIY DAC is configured to play DSD only for maximum performance, so at the moment I can’t play any PCM files. HQ Player will convert PCM to DSD on the fly – althopugh I would have to pay for this, is it possible to install this application on AP Linux? Hi, thank you for perfect optimized audiophile unix based os, traditional PCM and HIRES playback works and sounds amazing! on my stereo equipment. I have only one BIG problem with SACD/DSD playback in MPD/Cantata . DSD material plays with high frequency NOISE! , please HELP ME. DSD format is DFF. If I start GMPC I get the message “The config directory is not a directory”. I can start Cantata and also mpd without any problem. What is going wrong with GMPC ? Hi, I’m using Cantata now. My dac only support 24bit/96kHz, no usb input. I connect it with a usb/spdif converter that can support up to 32/384. My dac cannot receive any signal when I play 192kHz files. Can I resample it to 96kHz? Does this support dsd iso files? If you extract them into .dsf files. Hi, I’m using Cantata now. My dac support max. 24bit/96kHz, no usb input. I connect it with a usb/spdif converter that can support up to 24/192 My dac cannot receive any signal when I play 192kHz files. I tried to resample (ALSA) with MPD. Unfortenately withouit success. Resampling (ALSA) with the other audioplayers, deadbeef and Audacious, is no problem. How to resample with MPD? I managed to install V4 this evening (had some issues with cleaning an old SSD but other than that very smooth). I wanted to ask if small buffer time and period should in theory sound better. I am currently at 512 buffer and 256 period and the music seems faster with more detail. Would it be better to push it to minimum values ? (it seem to be the case on my Puppy Linux – very low values sounded best on ALSA output). In any case, the system sounds incredible, thank you for all your hard work ! Does anyone noticed the diference in sound quality between Cantata and Deadbeef ? Deadbeef sounds more clear and a littlebit louder than Cantata. What could be the reason ? MPD is on default setting except I removed buffer and period time. Cantata works. I thought that they use the same base (alsa) for playing the sound. Any help ? I bumbled and stumbled around and somehow I fixed it. Meantime, I’ve tried a few other “phile” distros on an old computer that’s sitting around unused, and none of them sound as dynamic as APL. deadbeef and audacious, also no sound on the internet. any suggestions? Sorry for the huge delay. I got busy and haven’t been back this way in a while. If we’re lucky, you’ve already solved your problem. Anyhoo…as I said previously, I was was just stumbling around trying some of everything, but the last thing was to simply go back and repeat the pacman instructions. I re-booted, and when it came back everything was miraculously working. I wish I could be more technical about it but I’m just like anyone else learning a foreign language. If all else fails, do as I did in the beginning, re-install and re-install, and re-install. It’s worth the effort because I’ve tried almost a dozen others and this is the sweetest sounding package I’ve encountered, regardless of the platform. I had to install it twice becuase the first time it did not work, I should have forgotten something. The second time everything went well. I play music with Audacious. I could not get Cantata working. I keep on trying! Yes, I’ve found it. I had configured Cantata wrong, whil econfiguring Cantata I had choosen the second option. I deleted the cantata.conf file in /home/myname/.config/cantata. And started Cantata again and choose the firts option while configuring Cantata. And I have installed the M.A.L.P. app (MPD) app from the Playstore. Password is 1234. And I have now a remote controler for Cantata on my laptop. The standard USB protocol of my CambridgeAudio DacMagic 100 is USB Audio 1.0. I want to change it to USB Audio 2.0 because then I can use the 24bit – 192 kHz option. How to do? If I set the DacMagic 100 to the USB 2 protocol, Cantata won’t play! Poweroff the DAC and AP-Linux and restart? But I think you tried it. Yes I did, I also took off the powercables. No results. I now see Deadbeef and Audacious play music in 24 bit 192 kHz. Only Cantata refuse to play at all when the Dac is in the USB Audio 2 protocol. I will look if I can find the isue in Cantata itself. It does not make much sense but maybe with USB 2 it has an other soundcard or device number? 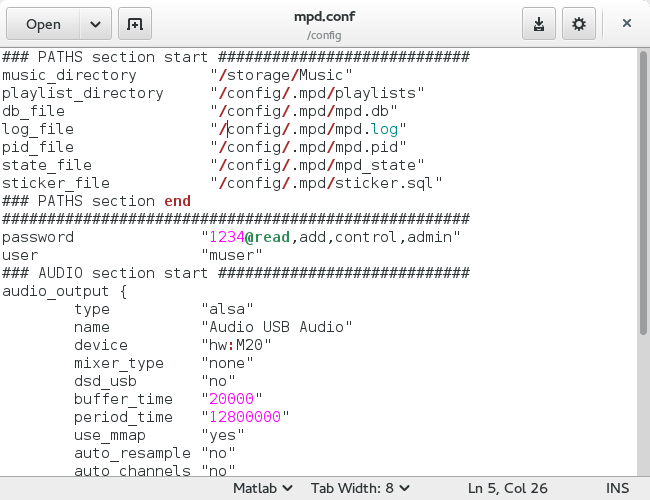 In Terminal: aplay -l and then look at the mpd.conf? hw:cardNumber,deviceNumber. And there is USB 2!!!!!!!!!!!!!! Thanks for helping and motivating! Oeps, I forgot testing. When I switched the DAC to USB 2 mode, Cantata won’t play the music. I will try it an other day again. It is a few weeks later, I tried it an other time after reading your posts again. Started the laptop, started the DAC in USB mode 2, checked the soundcard, set the Default soundcard, started Deadbeef. Music by 24 bit 192KHz. Closed Deadbeef, started Cantata, played the same music and Voilá. 24 bit 192 KHz. I do not know why it is oké by now. Perhaps I made a mistake the former times. Thanks you all again for helping. Can anybody tell me what version of mpd is current in ap-linux? I need 0.21.x to solve a problem with streaming google play music, and I am finding it difficult to compile mpd versions in other distros. You can find out by typing mpd –version at the console. If you can update it, it will be 0.21.4-2.